One of the things I've started trying to pull together is a "comprehensive" spreadsheet organised by lap-and-driver containing all sorts of data grabbed directly from FIA timing sheets and also derived from that data (see the Data page for links). 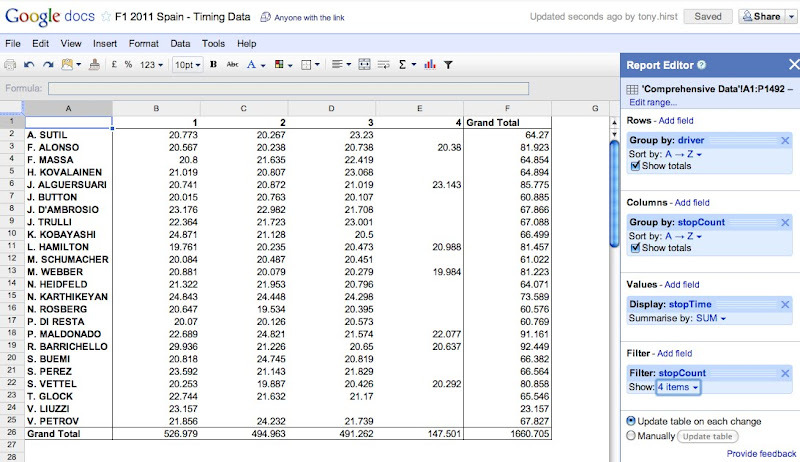 This mega-spreadsheet can then been re-mined to produce all sorts of different reports. Howto embed the interactive table: View Source to see how I embedded the interactive table using data pulled dynamically from a Google spreadsheet.